The American Working Families Action Fund, a 501c4 founded by DC-based Democratic campaign operative Bud Jackson, is keeping up its TV assault on Gov. Tom Corbett. The group began a multi-market campaign last week and it continues today with a new spot. The theme is the same: Corbett is helping his allies and donors at the expense of the middle class. 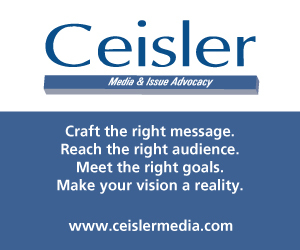 The ad begins with a woman saying direct-to-camera, “Our eyes are wide-open, Governor Corbett” – a reference to his controversial comments about the proposed ultrasound mandate. “We saw you take money from a former coal executive whose company polluted our drinking water,” says another person. “And then we watched you appoint him to a position that polices environmental permits,” says a third. That line is a reference to Alan Walker, the secretary of the Department of Community and Economic Development. In his current role Waker, who contributed over $100,000 to Corbett’s campaign, has discretion over numerous permitting processes. The Pittsburgh Post-Gazette editorial board opposed his appointment on those grounds. 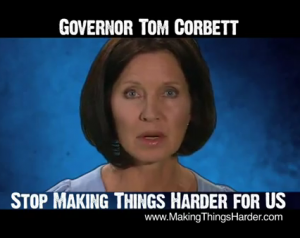 The ad also repeats the misleading claim that Corbett’s 2011 budget proposal cut over $1 billion from public education. The deficit was the result of the expiring stimulus funds; though overall schools saw a cut, the state’s spending on the Basic Education Fund (BEF) actually increased. Clarification: Numerous readers have noted that though state funding for BEF increased, overall education funding decreased by approximately $150 mil from FY 09/10 to the current budget, FY10/11. It’s significant, though not as devastating as $1.3 billion. 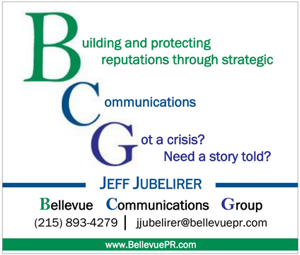 The buy is the same as last time: on cable in the Harrisburg market and on network television in the rest of the state. Jackson said the the total buy was in the hundreds of thousands of dollars. Full disclosure: AWF Action Fund is also advertising on PoliticsPA. Corbett spokesman Kevin Harley reiterated his criticism of Jackson, noting that he previously consulted for Democrats that Corbett prosecuted as Attorney General. “Once again we hear from the former media consultant for convicted felon Bill DeWeese and the recipient of more than half a million in fees from the House Democratic Campaign Committee at a time it was under the thumb of convicted felon Mike Veon,” Harley said. In addition to DeWeese and the HDCC, Jackson has worked for a number of Democrats in PA and elsewhere, including Arkansas Lt. Gov. Bill Halter’s Senate campaign, and previously that of Illinois Sen. Roland Burris. In PA, he’s currently consulting for Eugene DePasquale for Auditor General. “We leave it to others to decide Bud Jackson’s motives. But it should be clear to everyone that we are dealing with a remnant of machine politics in search of attention,” Harley added. Jackson says the funding for the ad came entirely from donors in PA, and that he personally had not contributed money to the effort. But he would not give further details about the group’s financial backers, disclosure of whom are not required by the law. The group also opposes Republican Wisconsin Governor Scott Walker and supports Massachusetts U.S. Senate hopeful Elizabeth Warren. Ed Rendell had plenty of time to spend and spend, with a house all too happy to enable him (most of the time). The major dishonesty in the second ad, never having seen the first, is the fact that a tax deferrment or a tax break is not a spending increase. I am tired of seeing this phraseology being used at every level, as it is to imply that if less is taken from what you earn, somehow the government is giving you something. I don’t have an obligation to give more to people in Harrisburg or D.C., regardless of political party, who have proven for decades they care not how they waste it. In 2008 the Pa. Legislators passed House Bill 239 Act 34 which allowed municipalities to mandate that all homes within 150 feet of a city water line, connect, use and pay for fluorinated/chlorinated water. This bill also mandated that all private water sources on your property be disconnected. This bill goes against Riparian Law which is a well established water freedom written hundreds of years ago. Gov. Corbett will not address this injustice that is being forced on the people of Pennsylvania. It is clear that this state plans to gain control over all of the water in this state and make the common citizen pay for it!! Why is government employee Kevin Harley handling Corbett’s political communications? Shouldn’t he be referring these questions to a campaign spokesperson? And today we learn that Gov. Corbett is planning to give Shell Oil company $1.6 BILLION over 25 years to do business in Pennsylvania. That’s almost twice the amount he has cut from public education, crippling schools across our state. And what will we get from Shell? The governor expects the plant will create 10,000 jobs — that is far less than the 14,000 jobs that were cut from our schools last year alone! It’s time to invest in education. That’s just nuts. We need adequate, equitable, and sustainable public funding for public education. I think this ad is spot on. For two years now we have been watching Corbett help the 1% and hurt the 99%. We are watching.